But on a long-ago cruise when I ordered clam chowder, I received a big white bowl with some chopped clams in the bottom. Mighty skimpy. Then the dining room waiter poured a small pitcher of clam chowder over the clams. That’s more like it, I thought. On my Carnival Victory cruise, I saw the same look on the face of a newlywed bride at the dining room table next to mine. 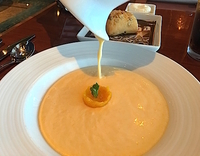 She had ordered chilled peach soup. What she got was a big white bowl with a blob of chopped peaches. Then the dining room waiter poured a pitcher of soup over her peaches. I could hear the bride and her husband laugh as they realized how puzzled they had been. Cruises are a wonderful way to try something new. In fact, Carnival encourages that yearn to try unusual food. Very cute idea. And very popular judging by my dining companions on the Carnival Victory. I must be an adventurous eater because I have already tried most of them. It’s a safe bet that if you don’t like that night’s choice, a Victory server will be sure to bring something else that you do like. 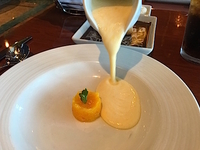 A couple of times I have not finished my appetizer or entrée – certainly not that it wasn’t good, just that it can be food overload on a cruise. Invariably, my server would ask if the choice wasn’t to my liking and if I would prefer something else. In case you are curious, here are Rare Finds choices on my cruise. The salmon was great. Frog legs and rabbit, I didn’t need to try. I ate both rabbit and frog legs plenty of times as a child when my father caught them and my mother cooked them. Ox tongue I have never knowingly eaten and don’t intend to eat, even though the server said it is quite delicious. Also as part of Carnival’s new American Table style is a different place setting than many passengers are accustomed to seeing. There are no tablecloths except for the formal Captain’s Dinner. Instead, the lovely wooden tables get to show their shine. Doesn’t bother me at all not to have tablecloths. Just think about all the laundry that saves. So much more environmentally friendly. 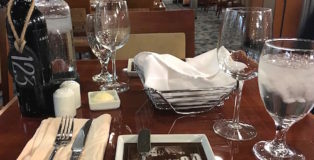 On other cruise ships, I have seen servers changing tablecloths as soon as diners get up to leave so the table is ready for the next diners. On the Victory, servers respond quickly to clean tables and set them anew. We do have cloth napkins, plus a big carafe of ice water sitting on the table. Part of the dinner table décor for American Table is cute little bread plates with images of American city landmarks. 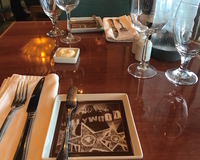 For dinner my first night, I had a plate with the Hollywood logo sign. Each table has a wine bottle with a stone on a rope around it with the table number. I don’t have a reserved table but have been escorted to a window dining table every night. That’s because on the first night when asked where I would like to sit, I answered “window” and the dining room staff remembered that. The menu is long and seems to offer something for everyone. It starts with about 10 appetizer choices, including fried calamari, chilled Vietnamese roll, cream of ripened tomatoes, shrimp cocktail, smoked chicken quesadilla, corn chowder, heart of lettuce, kale or romaine Caesar salad or lychee bisque. That’s was our first night’s dinner. Next on the menu is entrees – slow cooked prime rib, spanakopita and stuffed bell peppers, grilled jumbo shrimp, teriyaki salmon fillet, spiral pasta with mushrooms and aged parmesan or the featured vegetarian of Indian style vegetable dish with lentils, basmati rice, pickles, papadam and raita. Each evening, diners can also select “From the Grill” entrees such as salmon fillet, flat iron steak, chicken breast and pork chop. For an extra $20, diners can choose one of the following: broiled filet mignon, New York strip loin steak, broiled Maine lobster tail or surf & turf. All the entrees come with side dishes but those also can be ordered separately. Side dish options include mac & cheese with bacon, creamed spinach, ratatouille, baked potato with all the toppings, sautéed green beans and french fries. The “Port of Call” offers a special cocktail, appetizer and entrée. The Cozumel cocktail was a margarita made with El Jimador Tequila, Patron Citronge and lime juice. Appetizer was tortilla soup with braised chicken. And entrée was steak tacos grilled over an open flame and topped with fresh pico de gallo, cilantro and avocado-arbol chili. Desserts have included Carnival’s signature melting chocolate cake, crème brulee, chocolate hazelnut cake, apple crumb pie with ice cream, baked Alaska, cheese plate, tropical fruit plate or ice cream. On the featured wine list are several choices, including Carnival’s special Gifft wines by celebrity winemaker Kathie Gifford – a chardonnay and a red wine blend. Carnival Cruise Line began offering Gifford’s wines in 2015. Before that, the “Today” show host and former Carnival spokeswoman had joined the cruise line in the 1980s where she sang and danced her way through several ad campaigns. That’s a fun thing about cruises – a chance to try something different and learn something new. Chrome and silver. Gold and purple. Neon lights. Orange leather seats. Triangle-patterned bar stools. Plush sofas. Squiggles and curlicues galore. 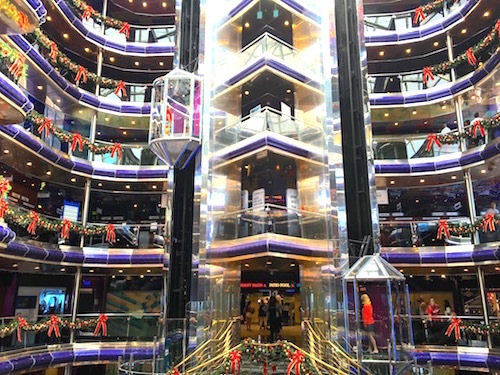 The Carnival Sensation décor, to me, looked like retro ‘60s mod. I almost expected to see movie secret agent Austin Powers sashaying down the ship promenade. I lived through those times so I like the styling of the 25-year-old ship. The heart of the ship is the soaring glass-and-metal atrium. Two rocket-shaped glass elevators zoom up and down for great views. The Atrium Bar is a hopping place with drink specials and live music on a raised stage over the bar. 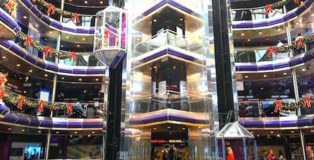 The Deck 7 atrium is home to Guest Services, Shore Excursions, and a five-station Internet Café. 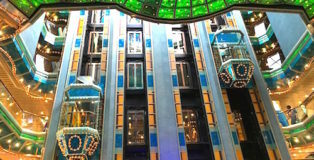 Deck 8 has Fantasia Lounge and the ship’s Fun Shops offering Carnival souvenirs, toiletries, cruise clothes, handbags, designer watches, sunglasses, jewelry, liquor, cigarettes and more. The Promenade on Deck 9 is aptly named. It’s a good place to walk, glance in the galleries, see the action in the casino, browse Pixels photo gallery, stop by the new Cherry on Top gift and candy store, and more. The ship’s photographers do a good job and I’m sure those ship photos often become valued family memories. The photographers roam around taking casual photos and they also set up beautiful backdrop sets for special nights, particularly during the captain’s dinner which is the only dress-up night on our five-day cruise. Photos are displayed on large boards and can be bought or not. Life goes so quickly and I know from my own experience that families often put off having a professional photo taken, thinking we’ll do it later. But later might not come. On my home office desk are two ship photos of a cruise I took with my grandson Logan and my sister Elaine. Brings back happy memories. Built in 1993, Carnival Sensation does have some inconveniences. It is one of those you-can’t-get-there-from-here ships. For my first night’s dinner, it was a bit of a hunt to find my Fantasy Dining Room on Deck 8 forward. Sounds reasonable to walk up to Deck 8 or take an elevator there but if you arrive at the wrong end of the ship, you’re out of luck. You can’t just walk to the other end of the ship on Deck 8. There is no thruway. Instead, you have to either go up and come down or go down and come up. Quite a few of us seemed lost that first night. One woman said she would just follow me. With my sense of direction, that might not have been a wise move. But we did find our Fantasy Dining Room. On Deck 0 is the medical center. Two self-service coin-operated laundries are busy places on Deck 6 and Deck 7. At the top of the ship on Lido Deck 10 are two whirlpools, the main pool and an activity stage where dance lessons are offered and games such as corn hole are played. Carnival Waterworks is on Deck 11. For folks at least 21 years old, Serenity Whirlpool is located on Deck 9. The Carnival Sensation is a grand old lady who is not ready to hang up her traveling shoes. And she shouldn’t. Doesn’t bother me at all. Just think about all the laundry that saves. So much more environmentally friendly. On other cruise ships, I have seen servers changing tablecloths as soon as diners get up to leave so the table is ready for the next diners. On the Sensation, servers respond quickly to clean tables and set them anew. We do have cloth napkins. Just no tablecloths except for the formal Captain’s Dinner. 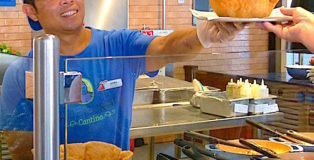 It’s all part of Carnival’s new American Table style. I like it. One of the American Table changes I like most is a big carafe of ice water sitting on the table. I can pour it myself when my glass is empty. Usually, a server will quickly notice and do the pouring for me. But I like the option of knowing that there is plenty of ice water right within reach throughout my meal. 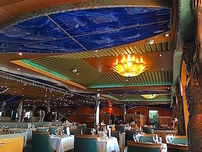 The Carnival Sensation has two dining rooms – Fantasy and Ecstasy. Ecstasy is open for scheduled seating. I’m in Fantasy because I chose “Your Time” dining. That means I can show up in the dining room anytime between 5:45 and 9:30 p.m. Some folks like a set reservation for each night’s dinner to prevent any possible waiting in line for a table. I prefer the flexibility of “Your Time” in case I want to stay ashore a little longer, finish a shipboard activity or write a blog while it’s still fresh in my mind. I prefer to dine early so have had no trouble getting a seat around 6 p.m. I have noticed a bit of a line when I’m leaving the dining room around 7:30. Each table has a wine bottle with a stone on a rope around it with the table number. I don’t have a reserved table and have never been escorted to the same dining table twice. But that is fine with me. Lets me see more of the dining room and be seated near different passengers. The menu is long and seems to offer something for everyone. It starts with about 10 appetizer choices, including fried calamari, chilled Vietnamese roll, cream of ripened tomatoes, shrimp cocktail, smoked chicken quesadilla, corn chowder, heart of lettuce, kale or romaine salad or cured salmon with candied tomato. That was our first night dinner. Next on the menu is entrees – sweet and sour shrimp, grilled swordfish steak, honey glazed pork loin, braised beef brisket, vegetable lasagna and Indian vegetarian. Each evening, diners can also select “From the Grill” entrees such as salmon fillet, flat iron steak, chicken breast and pork chop. The “Port of Call” offers a special cocktail, appetizer and entrée. The Ocho Rios cocktail was pirate punch made with Bacardi Rum, Bacardi 8, Amaretto and orange juice ($8.95). Port of Call appetizer was jerked chicken wings served with banana chips and jicama slaw. Entrée was shrimp curry, sautéed shrimp in Caribbean curry sauce with lemongrass, chilies and tropical fruit, served with coconut rice. 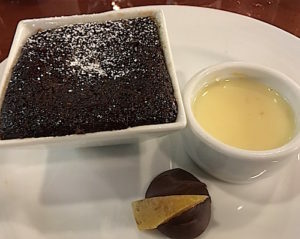 Desserts have included Carnival’s signature melting chocolate cake, crème brulee, chocolate hazelnut cake, apple crumb pie, cheese plate, tropical fruit plate or ice cream. On the featured wine list are several choices, including Carnival’s special Gifft wines by celebrity winemaker Kathie Gifford – a chardonnay and a red wine blend. 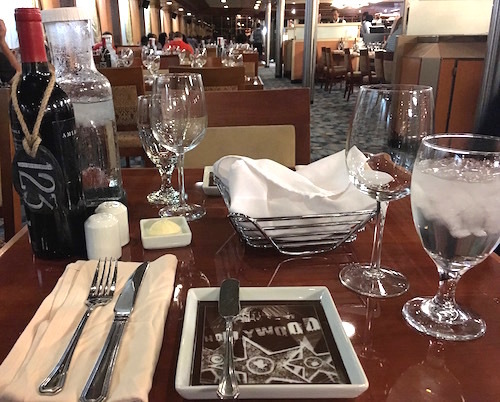 Carnival Cruise Line began offering Gifford’s wines in 2015. Before that, the “Today” show host and former Carnival spokeswoman had joined the cruise line in the 1980s where she sang and danced her way through several ad campaigns. A couple at the table next to me celebrating a young man’s college graduation ordered the Gifft chardonnay and said it was good, if a bit on the sweet side. They also plan to try the Gifft red blend at a later dinner. That’s a fun thing about cruises – a chance to try something we may not normally eat or drink at home. 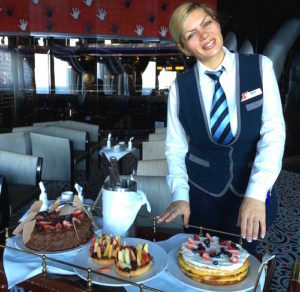 Carnival’s new ‘American Table’ style doesn’t include a tablecloth, except for the formal captain’s dinner. Bread plates feature images of American city landmarks. 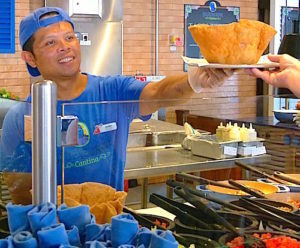 From appetizers to desserts, Carnival Sensation dishes feature lovely presentations. 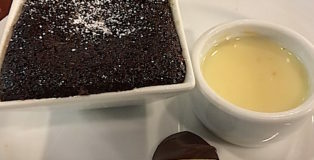 Carnival’s chocolate melting cake is always a popular dessert choice. On our first relaxing day at sea, I went to the afternoon tea in the unusual Touch of Class room. To enter the room, you walk through a doorway composed of two giant silver hands arched upward with fingertips touching. Window seats also are created by the same arched hands. Red tiled walls have black and white handprints. A little girl named Kimberly from Miami came skipping in the room along with her grandmother. Kimberly sat primly while she was served tea, tiny sandwiches and sweets. I’ll bet that tea time with her grandmother is something that 5-year-old Kimberly will remember long after our cruise is over. So far, I’ve seen that family – including two teens – around ship enjoying cruise activities together and apart. Without any cell phones in view. Of course, It’s not hard to enforce the no-phone agreement. If you don’t pay for one of the ship’s Internet plans, you usually don’t have Internet. Carnival Sensation offers several Internet plans. The value plan costs $16 for 24 hours or $60 for the entire cruise. The value plan provides access to sites and apps, social media, email, news, sports, weather and more. The Premium plan costs $25 for 24 hours or $88 for the entire cruise. It provides access to all websites and apps, including such streaming services as YouTube, Spotify and more. Premium offers the fastest possible connection where coverage allows. These plans are so much better than previous cruise ship plans where you would pay so much for so many minutes. That meant you always had to keep an eye on how many minutes used, how many minutes left, and whether you had signed off after each use. If you didn’t sign off, you could find your Internet minutes being consumed while you weren’t using them. It was unusual and very heartening to see so few cell phones being pulled out at meals and activities. Most people seemed to be enjoying family together time and partaking in shipboard fun. Proudly wearing a necklace gift from his mother and a T-shirt proclaiming it was his birthday, Christian said that what he likes best on the cruise is the arcade and the food. The daily FunTimes schedule is packed, especially on our two days at sea. Activities seem to go from sunup to after midnight. 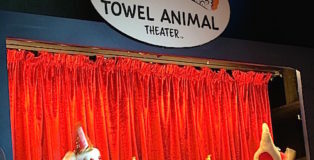 Choices include early morning yoga, evening stretch classes, art auctions, karaoke, dance lessons, bingo, raffles, free liquor tasting and tons of trivia games. Some of the trivia topics are Decades, Slogans, Sports, Movie Quotes, Food and Drinks, Game of Thrones and Friends. The ship’s comfortable movie theater has shown “Dunkirk” and “Wonder Woman” so far on our cruise. Unlike other large cruise ships, Sensation doesn’t have a big screen by the pool for movies under the stars, sports games and concert tapes. Also, if you are a serious sports lover, be forewarned that there is no sports bar on the Carnival Sensation. I did see a couple of dedicated fans huddled around a small TV watching an ESPN football game near the Lido Aft Bar. 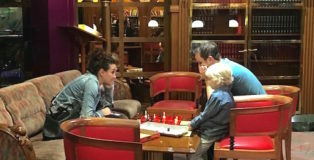 The Sensation does offer a very large library in the Oak Room with books and board games that can be checked out on the honor system. 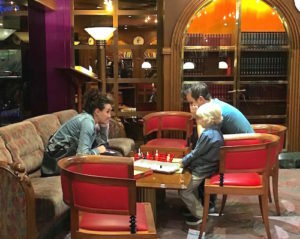 It was nice to see families and couples in there playing board games. Chess, Yahtzee and Scrabble seem to be popular.